Beautiful, instant update for living room! Easy install and beautiful effect! Love it on the wall! Great addition to the room! Wish it was longer as much as it is wide. Thank you! Follow the simple instructions at the base of each numbered sheet. It's peel and stick-and the pattern even overlaps so you don't have to worry about the seam showing at all. I'm very impressed with the ease of installation, cleanability, and quality. I wish I would have discovered this product sooner. Thanks! 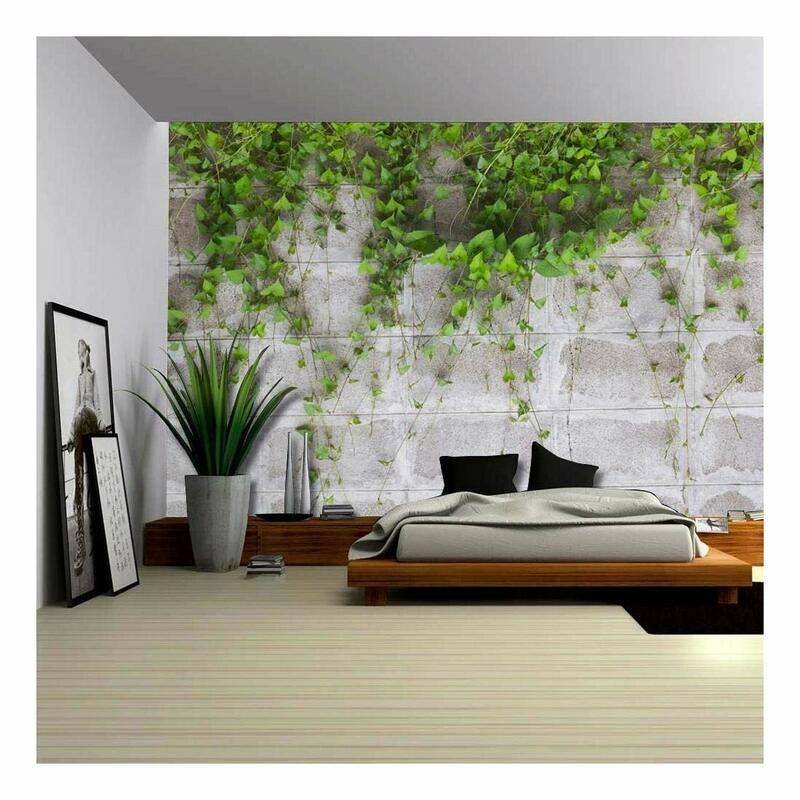 This product looks great - I specifically got the “Green Vines Draping From An Old Brick Wall”, but it comes with no instructions, so you’re kind of on your own for technique. Here’s the way I did it, after losing an entire panel to applying it wrong. First, make sure you start IN THE CORRECT ORDER ON THE CORRECT SIDE. Even though the panels are numbered (e.g. 1 of 6, 2 of 6, etc. ), they do NOT tell you in which direction the panels match (i.e. should 2 of 6 meet 1 of 6 on the left side or the right side?). Double check this before you start so you don’t put a panel that should be all the way on the left all the way on the right instead, like I did. 1. Have one person hold the panel up and align the top half with the adjacent panel such that the patterns match. 2. Have a second person simultaneously lining up the bottom half, instructing directions to the person holding the top, like “a little lower and to the right”. The person on top makes the adjustment, while also making sure the top pieces still align. 3. Once the panel is lined up, hold it in place firmly while the person on top peels off around 3-4 inches of the backing paper from the very top, all the way across. 4. Starting with the top corner closest to the adjacent panel, gently stick it on and work your hand smoothly across the top to affix the top strip of the panel (it should be fairly lined up with the ceiling). 5. The panel now should be free hanging from the top, and the partner lining up the panel on the bottom can relax, since the panel should be in place almost perfectly at this point. All that’s left is to pull the backing paper down and away slowly, 5-6 inches at a time, and smoothly work your hands out from the middle to the edges. In theory the panel should line up almost perfectly so all you need to worry about is making sure the backing paper doesn’t rip (it’s pain to peel off the back once ripped). Attached is a pic of my finished product. Overall is looks great and has completely changed the makeup of the room. This is actually a pretty simple and inexpensive solution to brighten up a space; only reason I knocked a star off is for lack of any kind of instructions, even on the website. A simple guide like the one above would go a long way. It's ok. The image looks as though it was printed out of focus. I was expecting something sharp that would look like a real wall of vines but instead you have to be across the room not to notice it is blurry. Looks great in my son’s room! It was a pain to put up cuz it didn’t line up perfectly. The reason why I’m giving it a 4 out of 5 is because the image has some green tint to it (not just grey, black, and white) and the background is pretty pixelated. I think the review from the 1st customer is inaccurate and hasty. First, I have been an astrophysicist and photographer, and chose this this these for a museum I co-own. One - it's very difficult to capture a starry scene like this with and expand it to this size without some distortion. It's tough to get such fine resolution at this scale WHEN LOOKING at a close distance. This scene looks great when you step back, as it is meant to be seen. There is a little movement due to rotation during being photographed, but you don't normally see this in smaller scale, only at a scale like this. When you step back, it's still pretty cool. Two - the price is great. Three - as with any wallpaper project, you have to know what your medium is and how to apply. The peel and stick backing on this wallpaper did nto hurt my wall at all, there mush have been a cheap paint on the walls of the person who gave the bad review. Also, when using this wallpaper, don't be afraid to overlap by an inch or so... there is some repeat on each piece that allows for this, and it eliminated the seem that will be there otherwise, and it's hard to make any seem on dark wallpaper not show. I overlapped and the seems faded away and things lined up great. I'm using this paper as the backdrop for an astronomy and atmospheric room I'm creating for my museum and education centers expandingminds.com. I am employed some black light which makes the colors pop, and when set against the other projects in the room, it's going to look great. Easier to install than regular wallpaper. Looks good even when we messed up a bit.